60% SOLD OUT! Clayton Park Knoll Surrey Townhomes by MOSAIC Homes - New Clayton Village Rowhomes on the Park - Launching Spring 2010! 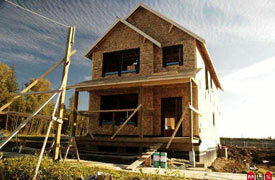 January 2010 Update: Sales Progress at KNOLL Surrey Townhomes Preselling! So far, MOSAIC’s KNOLL Surrey Townhome development is a great Success To Date! We've seen a great deal of sales activity at the presale Surrey KNOLL rowhomes over the past month with over 50% of our initial release now sold. We are pleased to extend to you an invitation to privately tour KNOLL Clayton Village Surrey real estate development ahead of our publicized Grand Opening in March. There's a wide selection of presale Surrey homes for sale here at KNOLL Clayton Village townhomes to choose from with stunning outlooks either South over a new city park or North towards the Coastal Mountains. Priced from $294,900 and most presale Surrey homes available pre-HST tax, KNOLL Clayton Village townhomes offers a truly unique selection of affordable homes that will remain valuable over time. KNOLL Blog News: Stay up-to-date by checking out our website at www•mosaichomes•com/knoll. Here you'll find the popular KNOLL Surrey Townhome blog, detailed Clayton Village home floorplans, virtual tours of each home, an interactive location map and much more. See below for our most recent blog articles and feel free to add your comments. We'd love to hear from you. Here are some great articles for you to read: Dressed to Impress: KNOLL Single Family Clayton Village Surrey development, A One-Stop Dog Shop, Sustainable Decor Idea and Big Hockey in Your Backyard. Call me directly at the number below if you are interested in setting up a private tour of the new Surrey homes and community at KNOLL Clayton Village MOSAIC real estate development today. I look forward to speaking with you. 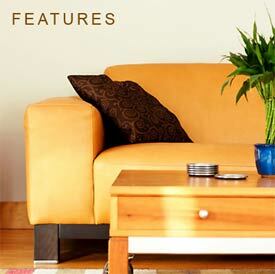 Kind Regards, Bonnie, KNOLL Sales Manager at Cell: 604-340-3453 or www•mosaichomes•com/knoll. * Pricing here at the new Surrey KNOLL Clayton Village homes subject to availability. Contact Sales Staff for details. A brand new MOSAIC Homes development in the heart of the Cloverdale-Langley corridor is taking shape in Clayton Village. The name of the MOSAIC Homes Clayton Village Langley real estate development is KNOLL Rowhomes and features spacious floor plans that maximize usable space, extremely large outdoor living and entertainment spaces as well as finely finished interiors. These high quality built and designed rowhomes at the Clayton Village Langley KNOLL rowhomes by MOSAIC Homes are now selling and features a great variety of single family homes and duplexes in collaboration with another developer in addition to the recently launched 40 brand new Clayton Village KNOLL Rowhomes in the Langley real estate market that presents affordable living for families and couples. The chic urban style rowhomes that MOSAIC Homes developers are so well known for will be built here at the KNOLL Clayton Village Langley rowhomes for sale and definitely keep the potentianl homebuyer in mind in terms of functional floor plans and interior features. Every detail has been carefully planned and built. From colums and corbels at the front entry foyer to the tumbler brick and chimneys in addition the expansive windows, the KNOLL Langley Clayton Village townhomes by MOSAIC Homes are definitely a great choice for new homebuyers who are looking for affordable spacious homes in the Cloverdale-Langley corridor. Georgian style architecture is what is used to describe the exterior facades, that have great curb appeal. The rowhomes at KNOLL Langley Clayton Village real estate district (not the single family houses or duplex townhomes) will range from 1183 to 1372 square feet over two or three floors and will feature 2 bed and 2 bedroom plus den layouts. Over 60% of the intial launch of the pre-sale Langley Clayton Village KNOLL rowhomes by MOSAIC Homes is already sold out! The convenient location close to Highway 1 and being situated just next to big box retailers and boutique shops, highly rated schools, local services, recreational facilities and parks make the KNOLL by MOSAIC Homes a definite hit amongst new homebuyers. In addition, the Clayton Village Langley real estate community has certainly been transformed with new developments sprining up in the past five years. What’s great about these floor plans at KNOLL Langley rowhomes is that the outdoor living spaces flow into the indoor living areas, making your entertainment and living areas feel that much larger. Art niches, window boxes, crisp craftsmanship and attention to detail are major selling features of MOSAIC Homes developers. Following the success of TATE and KEW, KNOLL Langley Clayton Village rowhomes are now nearing sell-out very quickly upon launching. The remaining KNOLL rowhomes start from just $309,900. The Knoll Home Store Opens – Launch of the Single Family KNOLL Surrey Homes! Single Family Home Floorplans Being Released and Private Tours Now Available at the new MOSAIC KNOLL Surrey rowhomes and homes. The Official Home Store Opens Saturday, February 13th. The day after the Opening Ceremonies in Vancouver, we will be having our own Opening Ceremonies at KNOLL Rowhomes...except we will have a lot more parking and you don't need to drop two grand on tickets. 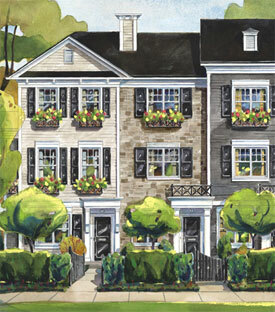 On Saturday, February 13th at noon, our Clayton Village KNOLL MOSAIC Rowhome Home Store will be open. Our public Model Home and Home Store launch will be taking place in early March 2010, so this is a great opportunity to get in ahead of the crowds. We'll be offering refreshments, Hard Hat Tours, and balloons and treats for the kids. Single Family KNOLL Surrey Homes Floorplans launching - When we open our Home Store, we will also be releasing our Single Family Home floorplans here at KNOLL Surrey Clayton Village. These single family Surrey home floorplans offer a spacious and functional layout specially designed to meet the needs of a growing family. We will be showing off the first draft of these plans at our KNOLL Home Store opening, so join us to find out more! Preview Tours on Now. Our private KNOLL MOSAIC Homes Hard Hat Tours have been a huge success and our initial release is almost completely sold out. If you are interested in setting up a private tour of the homes and community at KNOLL Surrey in Clayton Village, please feel free to give me a call. We can find a time that is well-suited to your schedule and give you the opportunity to ask all of the questions you have about KNOLL. January 2010 Sales Progress So Far in addition to updates on the Blog and Tours Tooday! Here is more information about the new Surrey KNOLL Clayton Park townhomes Success To Date! We want to keep you up to date on sales progress at KNOLL Surrey homes for sale. We're pleased to announce over 60% of our initial presale Surrey home release is now sold. With all KNOLL rowhomes available pre-HST and private tours available before our publicized Grand Opening in March 2010, we have seen a great deal of sales activity at presale KNOLL Surrey townhomes for sale. The presale Surrey home pricing starts from $294,900 with stunning outlooks over a new city park to the South and the Coastal Mountains to the North, KNOLL Clayton Park Surrey homes for sale offer a unique selection of affordable homes that will remain valuable over time. KNOLL Blog News - Stay up-to-date by visiting the popular KNOLL Surrey real estate blog. See below for our most recent Surrey real estate blog articles and feel free to add your comments. We'd love to hear from you. An Outdoor Living Room; How to Buy a Home Part 2: The What and Where; Sunrise at KNOLL and Dressed to Impress: KNOLL Single Family Surrey homes for sale, now available. Preview Tours on Now! If you are interested in setting up a private tour of the presale Surrey homes and community at KNOLL Clayton Park rownhomes please do not hesitate to give me a call: 604.340.3453. I look forward to speaking with you. Over 50% of Pre-launch Release Sold Out! We're pleased to share the news: Over 50% of our Pre-Launch Release here at the new Surrey homes for sale at MOSAIC KNOLL Clayton Park community is now sold out. However, a great selection of KNOLL Surrey homes still remain. Affordably priced from $294,900 with an additional pre-model home pricing incentive of $5000 on every home purchased before Jan 1, 2010. Now is the time to take a closer look at KNOLL by MOSAIC Homes. The New KNOLL Website Launch - Now you can explore our full KNOLL Surrey home website along with floorplans, virtual tours, and an interactive Clayton Park location map at www.mosaichomes.com/knoll. Check out the links below to read the most recent articles featured on the KNOLL Surrey Homes Blog. Feel free to add your comments, we'd love to hear from you. Floorplan Virtual Tours - Stunning Views to Mt• Baker - Unique Ideas for Clayton Park Home Furnishings. If you would like to learn more about this limited release of these new Surrey KNOLL homes by MOSAIC at Clayton Park or if you have any comments or questions, feel free to contact me. KNOLL Surrey Townhomes, A New MOSAIC Community. Following the popularity of KEW & TATE, we are proud to introduce KNOLL Surrey townhomes for sale, a collection of Two Bedroom and Two Bedroom plus Den Pre-construction Rowhomes and a limited selection of Single Family and Duplex Homes. With pre-construction KNOLL Surrey homes for sale available overlooking a park to the South and the Coastal Mountains to the North, these thoughtful well designed MOSAIC homes offer great property value. If you are interested in receiving further information about KNOLL Surrey real estate development, please register your interest online. The presale Surrey KNOLL Townhomes, Rowhomes and Single Family Home Preview Event This Saturday! This Saturday, we'll be hosting an exclusive KNOLL Surrey Homes Preview Event where you will have the first chance to find out more about KNOLL and see how you can secure a home through our advance purchase opportunity: When - Saturday, November 21st from 1pm to 4pm; Where - KEW Amenity Building 18983 72A Avenue, Surrey; RSVP - Bonnie at 604.340.3453. With KNOLL Surrey rowhome prices expected to start from under $300,000, this limited opportunity enables you to take advantage of pre-launch pricing ahead of the general public. Thank you for your interest in the pre-sale Surrey Clayton Park townhome community by Mosaic Homes real estate developer. The new Surrey townhouse community will be made up of 40 Georgian-style red brick row homes and offering two to three bedrooms. The Mosaic Clayton Park Surrey townhome community will be located at approximately 192nd and 73 Ave in Surrey real estate market. We expect to launch sales for these pre-construction Surrey Clayton Park homes in early spring 2010 at which point we will have a better idea of our pre-construction Clayton Heights Surrey home price points. If you are curious to know what to expect for a price range, the best comparison is our TATE community in Surrey real estate market, located just around the corner from the soon-to-be Clayton Heights rowhomes by Mosaic Homes, as it has similar floor plans that some people are now selling/renting out. Completion Dates will range from approximately summer 2010 to late fall 2010 for the new Surrey townhomes at Clayton Heights row homes for sale. Please feel free to email me should you be interested in any further details on this new Surrey townhome community. Warm regards, Jennifer at Mosaic Homes. Following hot on the heels of the success of their TATE and KEW rowhome communities, MOSAIC Homes is brining a new collection of only 40 Georgian inspired red brick Surrey rowhomes to the popular Clayton Surrey real estate district. Available in a broad range of two and three bedroom floor plans, KNOLL Surrey townhomes for sale will be right on the edge of a new park space and conveniently located just minutes from entertainment, parks, schools and shopping. Sales for these pre-construction Surrey homes at KNOLL by MOSAIC are expected to begin in the Spring of 2010. For more information about the Surrey KNOLL rowhomes for sale, please visit mosaichomes.com or call 604.574.0001 today. The roof is on the Clayton Rise clubhouse already and the townhomes are beginning to paper. The sediment pond is now under preparation and the roof is on! These are exciting times for the Townline Clayton Rise Surrey townhomes for sale. Clayton Rise promises to deliver on every single level that a Surrey homebuyer expects. There are the new Surrey townhouses themselves, and of course, all one hundred and forty three of them will be absolutely spectacular once completed. In addition, there is the new Surrey Clayton real estate neighbourhood, a lively community loaded with retailers and new restaurants for you to try. In addition, the greenways, cultivated village greens, surroundings and The Clayton Rise Clubhouse complete with an outdoor pool will be coming soon! Right now, these new Surrey homes for sale at Clayton Rise by Townline Homes really does offer everything you want: a complete and completely contemporary lifestyle for urbanites and families. 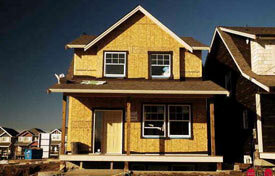 The first homes will be ready for move in in the spring of 2010, so they are coming soon! Clayton Rise Surrey, however, is available right now at presale pricing with only 5% GST and not the 12% HST at even more affordable presale pricing starting from $279,900. With almost five thousand square feet of party, fitness and movie rooms here at the Clayton Rise Surrey Clubhouse, this is where you may want to claim all to yourself when you move in. Huge windows, cathedral ceilings, and a twenty two foot cozy fireplace for conversation, entertaining or simple relaxation. The Clubhouse at the new Surrey townhomes at Clayton Rise Townline townhouses is also bound to be an epicentre for all homeowners, and will certainly be the perfect place for small or large gatherings amongst friends and family. With tonnes of recreational amenities as well, home owners will stay healthy by using the swimming pool, fitness gym or doing yoga every day. And there is even better news coming from the Townline Clayton Rise townhome development: it won’t be long before everything will be ready for you to move into. Finsihes are well underway inside the first Surrey homes for sale. Cabinetry will arrive any day on site, sidewalks and driveways are about to be poured, and exterior siding is all but done here at the presale Surrey Clayton Rise townhomes for sale. The Clubhouse is waterproofed (thank goodness) and both the plumbing and electrical has already been roughed in. Insulation, drywall and siding are about to begin here at the Clayton Rise Surrey homes for sale. If you are looking for a sneak peak at one of the hottest new Surrey real estate developments, look no further. The Clayton Rise Surrey homes presents a show suite featuring the work of Gannon Ross Designs and is open for previewing. Big windows complement the open and modern floor plans here. Oustide, the lush landscaping and individually fenced backyards continue the feeling of luxury. It’s a new Surrey home for sale you may never want to leave. And it’s all available now at presale pricing here at Clayton Rise Townhomes (two and three bedroom Surrey townhouses). Phase one sold quickly. Phase 2 sold even faster. Phase three flew off the shelves. Now, only 9 of Hertiance Surrey craftsman style homes remain at this new Townline real estate development. You can count them on two hands! Maybe we should be surprised. Surrey real estate was supposedly sluggish, after all, But what Heritance Surrey homes for sale offers is so rare in today’s Surrey real estate market place that we knew it wouldn’t last very long. Take advantage of the chance now to build a legal basement suite and the affordability factor goes way, way up. Rent it out as a mortgage helper here at the Surrey Heritance craftsman homes for sale, set up a secure home for an aging parent, or built your own home based business here. You can also just let the kids have their own space too. After all, you’ll be living out your own fantasy by purchasing a new presale Surrey home at Heritance Living by Townline. In the middle of the picturesque Clayton Surrey real estate neighbourhood, Heritance Homes is all about homes to love for a lifetime. Grassy backyards and big, finished basements. Verandas and bright, open floor plans, Classic crown mouldings, shaker cabinets and granite countertops are great features here at the new Surrey homes for sale. And each Heritance Townline home for sale is finished with exceptional craftsmanship that’s become a trademark of this top developer at Townline Group of Companies. If it sounds kind of old fashioned, it is. These are the kind of new Surrey homes for sale your grandparents cherished when they grew up, with the kind of conveniences and big-city amenities modern homeowners can’t live without at all. Old fashioned Crafsman style Surrey homes for sale. Old fashioned quality. And old fashioned pricing too! The Heritance Surrey homes for sale start from an incredible $479,000. And because they will be built and ready to move in prior to June 2010, you won’t have to worry about the BC HST either. FEBRUARY. IT MAY BE SHORT ON DAYS, BUT IT SURE IS LONG ON ACTIVITIES. Of course, there are the Winter Games happenings all over - from Richmond to Whistler. And, we are sure that some proud Canadians will place first in their events, but we'll have a few firsts of our own at Clayton Rise Townhomes in Surrey real estate market. Our first first is that we will be welcoming our first homeowners to the community. That's almost as exciting for us as it must be for them. Second, but still a first in its own right, is that The Clubhouse at Clayton Rise Surrey Townhomes for sale in Clayton Village neighbourhood will be completing. We wonder who will be the first to book that big screen TV? Our third first, is that we are busy setting up, not one but two Display Homes here at the Surrey Clayton Rise townhouses for sale. What better way to get a true feel for your future home than to actually walk through a home... or two? FIRST THINGS FIRST. SOME DETAILS. Here are the highlights of what Clayton Rise Surrey real estate development now available is all about: 2 and 3 bedroom Surrey townhomes in Clayton Village community, pitched roofs, light-filled rooms, and cultivated community greens, modern plans that maximize light, space and efficiency. The new Surrey Clayton Village community at Clayton Rise Townhomes for sale - connected by a network of footpaths, 143 townhomes in total, small village greens will provide gathering spots for friends, families and neighbours. The Clubhouse at Clayton Rise Surrey real estate community - 5,000 square feet - fireside lounge with wet bar, party room, outdoor decks, theatre, fitness centre, outdoor pool. In addition, the pre-display Surrey Clayton Rise home pricing is from 279,000. WANT TO GET IN BEFORE EVERYBODY ELSE? As you know, we're kitting out a couple of display homes. And, we will officially open the Clayton Village Surrey Clayton Rise Townhouse Sales Centre and Display Homes in March 2010. But, since you are registered, you have the opportunity to see the new Surrey homes for sale early. We will be booking appointments for February 20 to March 5. Call or email me to book your appointment now to be sure that you get in early to get a sneak peak at the new Clayton Rise Surrey townhouses for sale. AND, because you were wise enough to get on the Clayton Rise Surrey Townhome list early, we will also honour pre-display home pricing for you, until Saturday, March 6th at noon. All you have to do is print this email and bring it with you. Think of it as your "$10,000 I WAS SMART TO REGISTER" coupon. OUR WEBSITE IS YOUR HOME SHOPPING NETWORK - Go there. You'll probably be glad you did. It's very comprehensive and even includes new Surrey townhouse pricing. Why not? It'll only help with your decision here at Clayton Rise townhomes now selling. Visit often to see progress - construction photos are updated monthly - Check out all that's included, Learn more about the team behind Clayton Rise townhomes here at Clayton Village Surrey real estate community and learn more about the location and neighbourhood. THE SLINGS AND ARROWS OF OUTRAGEOUS FORTUNE? OR IS THAT JUST CUPID CALLING? It may almost be forgotten in the flurry of February fun, but February 14th is Valentine's Day. Why not buy your loved one a new Surrey home for sale? You have to live somewhere, so why not make it a home that love built? BOOK YOUR APPOINTMENT TODAY! The new Surrey Clayton Rise Sales Centre and Display Homes will open in March for everyone else. But, for you, we'll make an exception and let you see it in late February. So, call me, Elise, at 778.278.0030 (email elise@claytonrise.com). Go Canada! *Prices subject to change without notice. E & OE. Surrey Edge Townhomes Now Previewing! Opening on August 28th, 2009, the Lakewood Homes Surrey Edge Townhomes present a unique collection of prestigious and luxurious Surrey villas and townhouses for sale. The floor plans are open concept and family friendly, and the Lakewood Homes Edge Surrey Townhomes for sale are priced from just low $300,000s range (actually priced at $310,100 and higher to be exact). The new Edge Surrey townhomes for sale come in a variety of floor plans and layouts that range from thirteen hundred and thirty six square feet all the way to two thousand and forty two sq ft, for spacious and open living spaces. Built with the Travelers Home Warranty, this new Lakewood Homes development at 6956 193rd Street Surrey real estate market presents a new Edge Townhome show home that is open every day except Fridays from one to five in the afternoon. For additional information regarding the grand launch on August 28th as well as other pertinent details about the new Surrey Townhomes at The Edge by Lakewood Homes, please do not hesitate to contact Wayne at 605.574.1014. In addition, you can also visit the corporate Lakewood website at www.lakewood.ca or you can also visit the project marketing site for the new Surrey Edge Townhomes and Villas located online at www.edgehomes.ca (only a priority registration form and location map right now). The Edge is now launching a stylish new community of just seventy four two and three bedroom homes for sale within a central, quiet and family friendly neighbourhood. Almost a third of the Surrey Edge Villa Homes will have double garages, additional storage space and flex rooms in addition to tonnes of living space inside and out. Best of all, the new Edge Surrey townhomes start from $310,000 and for more information, please visit edgehomes.ca. Close to all the recreational options that homebuyers now seek when searching for a new Surrey home for sale, the East Clayton Edge townhomes create the perfect blend of both function and style. Clseo to the Cloverdale Exhibition Grounds, tonnes of shopping (both boutique and big box retailers), in addition to lots of schools, dining and recreational options, the East Clayton Edge Surrey townhomes for sale are now available from the low three hundred thousand dollar price point. There are only seventy four homes available in this new Surrey real estate development that features five floor plans and two fully furnished display homes for viewing at 193rd St. From cozy eating areas to granite, freipalces, hardwood (wide plank finishing) and laundry upstairs, these thoughtfully planned and designed pre-construction East Clayton Surrey Edge townhomes are absolutely stunning if you can come see them. Expansive kitchen islands are perfect for entertaining and cooking while large oudoor living spaces are perfect for families with small children and pets. Why settle for anything less when you can purchase a truly affordable Surrey townhome at The Edge in East Clayton neighbourhood. The Edge Surrey Showhomes are now open! The presales Surrey Edge showhomes are now open for viewing! Please come and visit our two newly furnished townhouses and showhomes at 6956 193rd Street in Surrey real estate market. We are open everyday from 1pm to 5pm. Please e-mail or call me at 604-574-1014 if you would like further information on Edge Surrey townhomes for sale. I look forward to seeing you very soon! 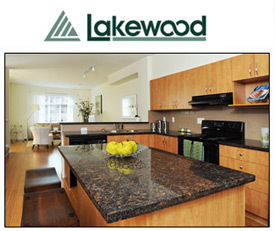 Thank-you, Wayne, Director of Marketing at Lakewood Homes – Edge Surrey Townhouses for sale - www.lakewood.ca. Straight from their email marketing blast: Thank-you for your inquiry to our new 74 unit townhome development, Edge Surrey Townhouses located at 6956 193rd Street. We are just commencing construction and at this time have not finalized pricing for the presale Surrey townhomes at The Edge by Lakewood Homes. We will keep you updated on our progress as we close in on the opening of our beautiful showhomes. As you are in our pre-registration database, you will have the opportunity to purchase a new Surrey townhome for sale prior to our opening to the general public. Please e-mail me or give me a phone call at 604-574-1014 if you would like further information on Edge Surrey townhomes for sale. I look forward to hearing from you very soon! Thank-you, Wayne. Urban Living. Redefined. By Lakewood Homes. Well designed homes for today’s urban lifestyle are now here and presented by Lakewood Homes Greater Vancouver real estate developers. We are all seeking a balanced life, one that includes a beautiful home nestled in a warm community of neighbours and friends, and effortlessly convenient. A place where you can live your life the way you always hoped it would be. Visit us online for more information, photos and floor plans. Showhomes open every day from 1-5pm (wxcept Fridays). The Edge is open every day. www.lakewood.ca. The Surrey Edge Villas and Townhomes are priced from $310,100 and includes net GST for a limited time offer. These Edge Surrey townhomes vary in size from 1336 to 2042 square feet and are located at 6956 193rd Street, Surrey. Speak with Wayne at 604.574.1014 today for more details. The Delta d’Anjou luxury townhomes for sale present the 4 remaining homes from 2332 to 2496 square feet and priced from $489,800. Located at 6838 Baker Road in Delta’s Sunshine Hills real estate district, please contact Ken at 604.572.1071 for additional details about d’Anjou Delta townhomes. There is now a seventeen thousand dollar cash back on selected remaining units here at Two Blue II family townhomes. Ranging from 1323 to 1985 square feet and priced from just $320,900, Two Blue II is located at 19480 66th Avenue. Please contact Terry at 604.534.4780 for more info. Phase 2 of ZAAN Surrey Townhomes for Sale on Now! Phase 1 was sold out! Now selling Phase 2 of the new Surrey ZAAN Townhomes – the essence of comfortable living. Two and three bedroom Surrey townhomes fro sale now selling at ZAAN living from just $329,900. For a limited time offer, the new ZAAN Surrey homes for sale will include the GST! New family townhomes are now here at this master planned family friendly Surrey real estate development located at 7156 144th Street, Surrey, BC. A family friendly Surrey real estate development neighbourhood of new Zaan townhomes for sale are nestled in the heart of the Newton community – one of the last affordable areas of the Fraser Valley! You wil find quality constructed Surrey homes for sale designed with open floor plans, generous kitchen areas and spacious balconies for casual family living but with a contemporary flair reflected in handsome appointments like rich wood flooring, granite counter tops and stainless steel luxury appliances, all standard features at the new Surrey Zaan townhomes for sale. Phase 2 of the new Zaan Surrey townhome community is now selling and the show home is open daily from one to five in the afternoon except on Fridays. Visit zaanhomes.com for additional information about the new Surrey homes for sale at Zaan townhomes, or simply call 604.307.0400 for more details today! Offering a great selection of 2 and 3 bedroom Surrey homes for sale, Zaan Townhomes are also affordably priced from the low $300s. 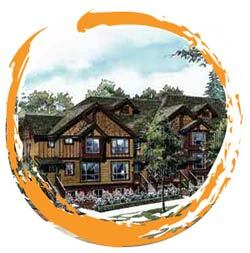 Zaan Surrey Townhomes for sale are situated in the family friendly neighbourhood of Newton. The quality residences are designed with open layouts, large kitchens and very spacious balconies for outdoor living spaces. In addition, the interiors at the presale Surrey Zaan townhomes will include stainless steel appliances, granite counters and even hardwood floors. Locateed at 7156 – 144th Street in Surrey real estate district, the Newton Zaan Townhouses in Phase 2 are located close to Costco, Surrey Library, Bear Creek Park, Newtown Wave Pool in addition to numerous public transportation routes, shops and restaurants. Comfortable living spaces and large floor plans with flexible rooms and open concept living is available at the new Surrey townhomes at ZAAN. Phase one is completely sold out and Phase 2 only has 5 homes remaining. The ZAAN Townhomes in Surrey real estate market are charming and traditional in terms of architecture, but modern and contemporary on the inside. From gabled rooflines to turrets and from outdoor living spaces to a solid community, the Surrey ZAAN Townhomes for sale feature the pizzazz and luxury features that make these homes so high-end and highly anticipated. Corner fireplaces, large patios and a kitchen that is fit for a gourmet chef are just some of the great features for homebuyers at the new Surrey ZAAN townhouses for sale. On the top level, you will find the sleeping areas with either a two or three bedroom layout available in Phase 2 relesae. The laundry closet is also upstairs, so that is very convenient. The diverse neighbourhood features great parks, the Bell Centre for Performing Arts and the Newton Wave Pool to name a few highlights. The ZAAN Surrey townhomes for sale are also close to all the major transportation routes and public transport too. The 2 and 3 bedroom ZAAN Surrey townhomes are now selling very quickly and are priced from the low $300’s, making them very affordable for families as well as first time home buyers. Offering a pre-sale selection of two and three bedroom Surrey townhomes for sale priced from just $329,000, Zaan Surrey townhouses is situated in a family friendly neighbourhood of new homes in the heart of the Newton real estate district. These quality residences at the pre-construction Surrey Zaan townhomes for sale are designed with open floor plans, generous kitchens, and spacious balconies making them ideal for casual family living but with a distinctly city-savvy outlook that comes from features like wood finishings, granite counter tops and stainless steel modern appliances. The pre-construction Surrey Zaan Townhomes for sale are located at 7156 – 144th Street in Surrey real estate market in Newton community – close to the Newton Wave Pool, Bear Creek Park, CostCo, Surrey Library plus shopping, restaurants and transportation routes. For more information about the new Surrey townhomes for sale at Zaan living, and to priority register your interest, please call 604.307.0400 or you can visit the Zaan Surrey townhome web site at www.zaanhomes.com. Marketed as townhomes that have the essence of comfortable living in an urban community, the Zaan Surrey Townhomes for sale are actually 45% sold out during the pre-construction launch already! A family friendly neighbourhood in the heart of Surrey real estate market is now at Zaan Townhomes where you will find a new Newton property community that represents one of the last affordable areas in the Fraser Valley real estate market. From rich imported wood flooring to granite countertops and from luxury stainless packages and elegant appointments, the pre-construction Surrey Zaan Townhomes for sale are great for casual family living or entertaining your friends and family. Well built and carefully designed floorplans at the pre-sale Zaan Surrey townhomes introduce open concept living with large balconies for outdoor living experiences in addition to spacious gourmet kitchens. Quality construction and great designs is what sets the Newtown Zaan Surrey pre-construction townhomes apart from other current offerings. Starting from just $329,000, these affordable Surrey townhomes present both two and three bedroom floor plans for sale at the moment. Currently, Phase 1 of the prestigious Newton Surrey townhome development at Zaan living is being released with over 45% sold. The entire master planned development will consist of three phases total and the first phase sales and marketing is well underway. The actual property address for the Zaan Surrey homes ofr sale is at 7156 – 144 Street in Surrey, BC. Representing a family friendly community that is nestled into a quiet neighbourhood in Newton real estate market, these two and three bedroom townhomes are great for being close to recreational and fitness centres, shopping, dining, King George Highway and 72 Avenue transportation routes. In addition, the family oriented Surrey Zaan Townhomes for sale are also close to banks, libraries, local conveniences and amenities, so that you can leave your car at home. 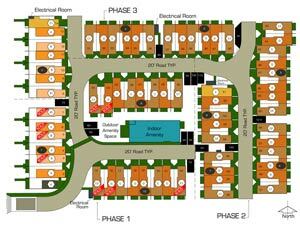 In terms of the three bedroom Surrey townhomes available at Zaan real estate development you have Floorplan Unit A which is 1568 sqft and Unit B at 1627 sq ft. Unit B1 at Zaan Townhome living is 1643 sq ft with tandem garages and Unit C is 1406 square feet with a patio and separate main level deck. Unit C1 at the pre-construction Surrey townhouses for sale includes 1447 sqft of living space and C2 is 1419 sqf, while C3 is 1543 sf and Unit C4 is 1419 sf. Unit D floorplan here at the Newtown Surrey townhomes for sale at Zaan Living are 1458 square feet in inside space while E1 is a smaller three bedroom home at 1391 square feet. The only 2 two bedroom Surrey townhome for sale at Zaan Newton property development is floor plan Unit E at 1300 sq ft and Unit H a 1659 sf with a huge den in the basement and an attached single garage. Even with just two bedrooms, this floorplan is one of the largest here at Zaan Surrey townhomes. Located close to beautiful Bear Creek Park with children’s playground, studio theatre, Newton Surrey big box retailers like Costco Wholesale, Canadian Tire, as well as Wings Restaurant, Canada Trust Bank, Real Canadian Superstore and the Newton Recreation Centre and Wave Pool, Fitness Centre, Arena and Newton Community Centre, homebuyers at the Surrey Zaan Townhouses will be ideally situated close to all local amenities. The exterior finishing for the pre-construction Surrey Zaan townhomes for sale will include an amenity building with lots of lounge and recreational space for all residents, visitor parking, an intimate courtyard with paved pathway, Duroid roof that is insured and vinyl siding. In addition, the interior features of the pre-sale Surrey Newton Townhomes at Zaan living includes double stainless steel kitchen sink, granite counters in the kitchen and shaker style countertops in the kitchens. In addition, homebuyers in the Newton real estate district of Surrey will enjoy ceramic tiling in foyer, bathrooms and the kitchens in addition to engineered hardwood laminate floors in the living and dining rooms that are contemporary and high-end. The interiors of the Zaan Surrey townhomes for sale will also feature electric fireplaces and open contemporary living spaces as seen from the awesome open concept floor plans featured here. From entertaining to quiet evenings, the Zaan Townhouses for sale are definitely flexible and contemporary for those urbanites seeking a family friendly master planned neighbourhood in the heart of Surrey’s Newton community. For more information about the pre-construction Surrey townhomes at Zaan, please contact Pawan of Sutton Group West Coast Realty at 604.307.0400 or info@zaanhomes.com. The Newtown Zaan Surrey homes for sale are located at 7156 – 144 St in Surrey, BC and you can also visit www.zaanhomes.com for additional information and resources. Breaking News: South Surrey Ocean Bluff West has recently launched their pre-sales for rancher homes. Can you believe it? Purchasing a brand new Bloomsbury Court Surrey condo is cheaper than renting! These new Guildford Park Place Surrey condos now selling feature spacious two bedrooms plus den layouts with two parking stalls as low as $775 per month (with a mortgage payment of this amount). These functional floor plans at the Bloomsbury Court Surrey condos at Guildford Park Place real estate development are about one thousand and seventy six square feet in size. An exclusive Bloomsbury Court Surrey amenity club for residents includes tennis courts, swimming pool, fitness and media room in addition to a putting green! Conveniently located near Guildford Town Centre, these new Bloomsbury Court Surrey condominiums are alos just next door to the Green Timber Urban Forest. Two bedroom plus den Bloomsbury Court Guildford Park Place condo units start from just $289,000. Three bed plus den floor plans start from just $313,000 and they are roughly one thousand, one hundred and fifty three square feet in size. Please call the Guildford Park Place Bloomsbury Court Surrey condo sales team today at 604.689.8898 to book a private viewing. There are only eight units remaining and you can move in today! The $775/month mortgage payments on your new Guildford Park Place Surrey condo for sale is based on interest rate of 2.5% with 35 year amortization with a variable five year term and a 25% down payment. Now selling and marketed by LA Marketing, the pre-sale South Surrey Rosemary Crest single family detached homes are offering their final five opportunities at luxury houses where neighbourhood spirit will welcome your family according to their advertising. Brought to the South Surey real estate market by well established and renowned T.M. Crest Homes builders, the Rosemary Heights South Surrey single family homes at Rosemary Crest has become of the most popular family friendly neighbourhoods in the area of South Surrey and White Rock in the past decade for great reasons. With established schools, recreational activities, tonnes of outdoor facilities and green spaces for kids to safely play and run around, the Rosemary Crest south Surrey Rosemary Heights community is really convenient for homebuyers and residents at this new community. With a location just two minutes away from Southpoint Shopping Centre as well as multiple coffee shops, dining options and shopping in Rosemary Heights South Surrey, the Rosemary Crest single family homes are also close to many golf courses including Morgan Creek, one of the best in all of B.C. 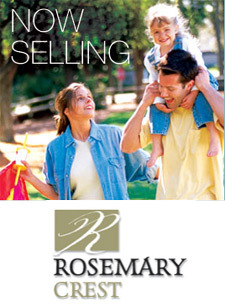 The pre-sale Rosemary Heights South Surrey single family homes have only five houses left for sale and they are all four bedroom Rosemary Crest homes offering between twenty one hundred and twenty four hundred square feet in interior space. This does not even include the finished Rosemary Crest South Surrey homes basements. Quality finishes and features are offered in every one of these new South Surrey Rosemary Heights homes for sale that include soaring vaulted ceilings in principal living rooms as well as two gas fireplaces per house and three bathrooms and elegant ensuites with the finest finishes. Other features of the South Surrey Rosemary Heights Crest single family detached homes for sale include exquisite maple kitchens with granite countertops and an extensive use of crown mouldings in the finishing touches. Great for families, this family oriented Rosemary Heights community at South Surrey Rosemary Crest homes for sale have an excellent model home for viewing that is open on weekends from two to four at 3549 Rosemary Heights Drive in South Surrey real estate market. Brought to you by LA Marketing. You have waited long enough, but here is the grand opening for the Surrey pre-construction Townhomes at Solana Residences that will launch pre-sales on Saturday, July 26 from 1 to 5pm. Brighten your soul at the pre-sales Solana Surrey townhouses that present fifty four luxurious residences with spacious three and four bedroom floor plans and layouts ranging from sixteen hundred and fifty to nineteen hundred square feet in size. Raising the bar in standard features, the pre-construction Surrey townhomes at Solana town houses will be spacious and sunny, and will be built with various lifestyles in mind. The community has it all and the features and interior finishes are spectacular. For more information, visit the Solana Townhomes presentation centre at 19560 68th avenue in Surrey, BC and RSVP by telephone at 778.278.6677. Solana Surrey Townhome Pre-Sales: Centrally located in Surrey’s every evolving East Clayton neighbourhood, Solana new surrey townhomes is a bright, stylish collection of 54 townhouses. These pre-construction estate inspired residences feature all the high end finishing details you insist on including granite counters, stainless steel appliances, soaker tubs, and plenty more. Prices for the presale Surrey Solana townhomes start in the mid $300,000s. don’t miss this opportunity to “brighten your sould.” The Solana townhome presentation centre and show home are open from one to five pm daily except Fri at 19560-68th Avenue in Surrey real estate. 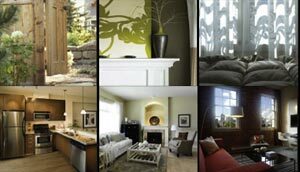 For more information, please call 604.780.8806 or visit www.solanatownhomes.com. An impressive new Surrey townhome development is taking shape at Solana and this is what the New Home Buyer Guide of Greater Vancouver Susan B has to say about this project: Solana. High energy, fun loving and vibrant, somehow the name alone reminds me of sunshine and happy times shared with good friends. So I’m delighted to discover the new presale Solana townhomes in Surrey real estate market incorporates all these elements with a touch of graceful elan thrown in for good measure. A great neighbourhood to savour for years to come. Living at the pre-construction Solana townhomes in Surrey real estate market puts you just minutes from all the city amenities you crave. Explore shopping from big box to boutique, pamper yourself with a massage and pedicure at Utopia day Spa, or indulge yourself in an afternoon of conversation over a steaming latte at the local bistro. Looking to get fit and active? You won’t have to go far from the presale Surrey Solana townhomes and family presale townhouses to discover a plethora of recreational options. If golf is your thing, Newlands Gold and Country Club or the Sunrise Golf Club are just two of your many options. Perhaps take the ice at Langley Twin Rinks or check out one of the local equestrian centres, just minutes away from this new Surrey townhome real estate development at Solana townhouses. For the adventurous, there are also aviation schools, roller blading and a BMX/skateboard park. In fact, your toughest decision at the new Solana Townhomes in Surrey property market may be which activity to start first. When you’re ready for a mental workout, Kwantlen University College has an astonishing array of offerings to stimulate your craving for knowledge. Parents too can rest easy knowing this nieghbourhood boasts schools at all levels, including the Langley fundamental School, nearby. And at day’s end, when you simply don’t feel like cooking, you won’t need to be driving to Vancouver for haute cuisine if you live at the new Surrey townhomes at Solana real estate development. From sizzling Mediterranean at Coza! To sensual simplicity at Katana Japanese Restaurant to upscale French cuisine set against the backdrop of a working inveyard at Bacchus Bistro, a smorgasbord of taste sensations are simply waiting discovery at these affordable Surrey Solana townhomes for sale. The presale Solana townhomes offesr a total of 54 three and four bedroom Surrey townhouses for sale ranging from 1634 to 1887 square feet. Prices for these Surrey Real estate releases start at $378,900. The Solana Townhome Presentation Centre and two fully furnished display suites are open 1:00 to 5:00 pm daily except Fridays at 19560 – 68th Ave in Surrey real estate. For more information, please call 778.278.6677 or you can visit www.solanatownhomes.com anytime to register your interest. As I wander through the first of Solana townhomes’ two display homes in Surrey real estate market, I can’t help thinking there’s a melding of old world tradition with contemporary design. Ceilings are high and accented with plenty of oversized crown mouldings. Kitchen cabinets at the presale Surrey Solana townhomes rpoperties are Shaker style in white, their brushed pewter handles forming a counterpoint to the richly texture porcelain backsplash in slate grey. Silestone counter combine durability with a distinctive “touch me” look to their smooth surface. Upstairs, I discover three bedrooms and a compact, functional computer niche tucked onto the stair landing – no wasted space in these new Solana Surrey townhomes for sale. The master suite at the Solana townhouses has two of my favourites – walk in closet with a window for natural light and an oval soaker tub with adjustable body massage spray. “People like the fact we offer both great room and traditional plans,” say sales rep Raj who joins me just as I’m heading off to check out the second Solana display home. And while this one definitely boasts the dark wood and separate, formal living room of tradition, tehre’s still plenty of contemporary detail as well – a sassy insert of metallic tile in the kitchen backsplash, energy efficient gas fireplace with flat screen TV niche above and sleek modernistic light fixtures in this new presale Surrey real estate development at the Solana Townhomes for sale. Both Solana display homes are equally impressive. Looking for more information about the new pre-construction Celeste Surrey condos at Strawberry Hill Community? Central to everything yet with the feeling of being away from it all, the pre-construction Highland at Sullivan Ridge is a collection of approximately 90 single family Surrey homes available in four floor plans as well as some real estate Surrey opportunities for custome designed homes. Prices for these pre-sales Surrey single family homes at Highland at Sullivan Ridge development start at $579,900 for these three and four bedroom pre-construction homes with two levels plus basement (many include full walk out patio from basement level). Upscale finishes include granite counters, hardwood flooring and luxury ensuites in every Highland Sullivan Gardens Surrey homes. Highland at Sullivan Gardens pre-sale single family homes in Surrey real estate market is celebrating is grand opening on September 13th at 146th Street and 60th Avenue. For more information and to priority register for more details, you can speak with Steve or Marka at 604.538.2125. An exclusive community of presale Surrey single family homes now starting from $579,900 at The Highlands at Sullivan Ridge. Grand opening for pre-construction pricing at these presale Surrey homes at Sullivan Ridge start September 20th and opens from one to five in the afternoon. The Highlands at Sullivan Ridge single family detached home value and advantages include: full granite kitchens, premium solid wood kitchen cabinetry, nine foot ceilings with vaulted accents and solid hardwood flooring standard in every new Surrey home. Also, all Sullivan Ridge Highlands homes in surrey real estate market will include spa inspired bathrooms, detailed millwork and finishing, dramatic gas fireplaces and ask about their grand opening bonus right now! Marathon Homes real estate development, the Surrey Highlands at Sullivan Ridge homes are sold by Mark and Steve at 604.538.2125 ro you can visit the Surrey show home at 60A Ave and 146th St. National Home Warranty for all presale single family homes here. Surrey Single Family Homes for Sale Now! The Highlands at Sullivan Ridge single family Surrey detached homes are at the heart of modern living according to Susan B for the new home buyer guide. Old World Charm are the three best words to describe these new Surrey homes at The Highlands at Sullivan Ridge with planters, porches, backyards and beautiful landscaping throughout the community. From formal dining rooms to decorative columns and from window box seats to spacious lots, the new Surrey homes at the Sullivan Highlands real estate development are certainly putting this Surrey community on the map for new home buyers and empty nesters in addition to growing families. Antique white cabinetry, dark stained center islands as well as wide plank hardwood flooring and beautiful walk in pantries are just some features that make these single family Surrey homes pop. A ledgestone recreational room in addition to backyard patios, views, bedrooms that are generously sized and laundry room are just features that are left out of many other new Surrey home developments, but not at the pre-construction Highlands at Sullivan Ridge houses for sale. In addition, the basements at the Highlands Surrey homes are huge with over one thousand square feet of prime living space for a gym, office, or entertainment room depending on what you feel like customizing. The growing community at the Highlands at Sullivan Ridge Surrey neighbourhood features tonnes of parks, walking trails, great schools, churches, local amenities and everyday conveniences. Located in between Guildford and Southpoint, the pre-construction Surrey homes at Highlands at Sullivan Ridge houses are in a prime location poised for years of growth in value. The first phase of these new Surrey single family homes at The Highlands has been launched and there are only ten 3-bed homes for pre-sale right now with attached, rear garages. The builder for the Highlands at Sullivan Ridge new Surrey homes is by Marathon Homes and you can visit Steve at the presentation office anytime. If you would like to visit the sales centre for the Sullivan Ridge Surrey Highlands single family homes, please do not hesitate to visit them from one to five in the afternoon except Fridays at 14597 60A Avenue. Located at 146 Street and 60A Avenue, these awesome pre-sale Highlands at Sullivan Ridge Surrey homes for sale are close to local schools, parks, walking trails, green spaces, restaurants, andtonnes of shopping at both Southpointe and Guildford shopping centres which are approximately 10 minutes away. The pre-sale Surrey Sullivan Ridge Highlands homes for sale are also close to all lifestyle amenities including golf, the water, White Rock and many other great location features. Marathon Homes has just launched their first phase of the Highlands four bedroom homes in Surrey’s Sullivan Ridge neighbourhood in addition to ten 3 bedroom homes with attached garages in the backside of the floorplans. A family friendly neighbourhood, the Surrey Highlands Homes at Sullivan Ridge offers full granite countertops in kitchens in addition to fully finished two and three bedroom basements. Detailed millwork and craftsmanship is seen through all of the Sulllivan Ridge Highlands Surrey homes in addition to solid hardwood flooring and nine foot ceilings with vaulted ceilings in certain living spaces which expand your living spaces. Some of the incredible interior features that are standard in every Highlands Surrey homes at Sullivan Ridge community include exterior Christmas light outlets, roughed in central vac system with sweep pans in the kitchen in addition to a roughed in security alarm system and outdoor gas BBQ outlets. In addition, Marathon Homes real estate developers will provide 2/5/10 year home warranty and premium low maintenance building features that include 2 remotes for the garage, electric water hot tank, insulation, high efficiency heating system and energy savings and zone comfort in every home. Other cost savings measures for you as the homebuyer here at the new Surrey homes for sale at the Highlands at Sullivan Ridge neighbourhood include TJI engineered silent floor construction, painted garage that is insulated, 30 year warranty on asphalt shingle roof, concrete foundations and much more. The spa inspired bathrooms here at the Sullivan Ridge pre-construction Surrey homes for sale at The Highlands include luxurious powder rooms that have granite finishes as standard, chrome faucets and hardware, ceramic til bathtub enclosures, plumbing fixtures that are high-end and framed bathroom mirrors. Some of the unique floor plan features of the bedroom include swing doors, berber carpeting, deep sills, spacious walk in closets and expansive window seats in certain new Surrey homes for sale Highlands floorplans at Sullivan Ridge family friendly community. The gourmet kitchens at the Highlands Surrey homes for sale include full height tiled backpslash, lots of storage in the pantry, under cabinetry lighting, oversized windows, double stainless steel bowl sinks, custom maple cabeintry with tonnes of craftsmanship, spacious eating earsa and Italian tiling. There are 3 colour palettes to choose from in addition to 9 foot ceilings, rich ¾ inch hardwood flooring (solid maple) in addition to maple craftsman staircase, berber carpeting, custom door headers and designer lighting package. The pre-construction new Surrey homes for sale at the Highlands at Sullivan Ridge real estate development also features six inch baseboards throughout, new classic architectural style, concrete patios, aggregate driveways and walkwaysin addition to landscaped outdoor living spaces. Located in the up and coming Guildford Park Place real estate community, the new Bloomsbury Court condo homes in Surrey property market as now available for sale and move-in today. Occupancy can be shortly after your purchase of a new Surrey Guildford home and at the current prices, the Bloomsbury Court condominiums won’t last long! A very high quality construction project in an affordable Surrey real estate development, the Guildford Bloomsbury Court condo apartments only feature eight remaining units for sale. An urban style project that provides great interior finishes, features and attention to detail, the Surrey Bloomsbury Court condominiums also feature a community fitness and amenity club exclusive for homeowners here and is over 10,000 square feet in size for you to enjoy. The new Bloomsbury Court Surrey condo amenity club features such things as a putting green for golf enthusiasts, fitness and media room for previewing movies and sports events, spa, swimming pool to keep active in addition to outdoor tennis courts for you to enjoy during the summer months. The Guildford Bloomsbury Court Park Place Surrey real estate development is brought to the market by Henderson Development Ltd. Of Canada. The remaining presale Bloomsbury Court condominiums in Guildford Surrey include everything from two bedroom and den at one thousand and ninety eight square feet and priced from $289,000 to $299,800 (that’s $263 to $273 per square foot .. the most affordable Surrey condo apartments) in addition to 3 bedromo and den suites at 1,214 sq ft between $315,600 to $327,900 (that’s $259 to $269 per sq ft, again the most affordable new Surrey apartment homes on the market). Also available is a single three bed and nook Bloomsbury Court condominium in Guildford Park Place that is 1,173 sq ft at $316,700 and roughly $269/sq ft as well as a single Unit 102 at Surrey Bloomsbury Court condo apartments which is a three bdrm plus den plus noon residence of twelve hundred and sixty six square feet priced at $329,100. Again, all new Guildford Bloomsbury Court condominiums in the Surey real estate market are very affordable, prestigious and high-end. You can now call 604.689.8898 to book a viewing appointment with a sales representative at the new Bloomsbury Court Surrey condominiums. The final release of eight presale Surrey condominiums homes at Guildford Park Place are now selling at Bloomsbury Court neighbourhood. Offering a choice of two or three bedroom plans with den or nook, these last eight Bloomsbury Court Surrey condo units are priced from $289,900. All pre-construction surrey homes include two parking stalls and access to the Guildford Park Place amenities building with outdoor swimming pool, sauna, gym, putting green, and tennis courts. Surrey Blooomsbury Court condominiums is located at 100th Ave and 148th Street in Surrey real estate market and is open by appointment only. For more information and to arrange a viewing, call Joanna Chan at 604.689.8898. There is currently no marketing web site for the remaining units at Bloomsbury Court in Surrey real estate market. But for how long? Launching their final phase of pre-sale apartment condos, the Bloomsbury Court Surrey real estate development offers resort style amenities and interior spaces with only eight remaining units. Time to move into this stunning new Surrey real estate development is upon us and right now, these centrally located Bloomsbury Court condominiums are almost all sold out. Located at 148th and 100th in Surrey, and next to the Green Timbers Urban Forest, the pre-sale Surrey Bloomsbury Court urban homes are within a short walking distance to Guildford Town Centre. Brought to the Surrey real estate market by Henderson Development Ltd, this English Tudor style apartment exterior property at Bloomsbury Court apartment homes is set amongst natural lush greenery and leafy tree lined streets that are both welcoming and warm. Resort style amenities at the Bloomsbury Court master planned community are exceptional and Henderson Development Ltd is now releasing their final phase of the Guildford Park Place apartment urban homes for sale. Mother nature friendly according to their property marketing, the Bloomsbury Court Surrey condo apartments offer putting greens, swimming, whirlpool spa, children’s playground and a convenient location close to entertainment, recreation, Guildford Town Centre and much more. The floor plans at the Bloomsbury Court Guildford Park Place apartments rnage from 1098 to 1266 sqft and from two bed plus den to three bedroom, den and nook layouts. Also, these affordable Surrey condo apartments at Bloomsbury Court start from an incredible offer at $289,000. The open plan kitchen features chef inspired finishes and appliances in addition to relaxing bathrooms with soaker tubs and sparking countertops. Also, the pre-sale Surrey Bloomsbury Court Guildford Park Place apartment homes feature nine foot six inch over height ceilings. The Courtside Club offers an incredible array of activities from fitness room, to outdoor swimming pool and from a spa/sauna to tennis courts an lush putting green for residents here. In addition, there is a multi purpose room and media centre set up for resident use. Bloomsbury Court Surrey urban homes offers convenience blended with a country ambience and resort style atmosphere. The best of both worlds. So what are you waiting for?